Doux et Luxueux Review: Does it Really Repair Your Skin Damage? 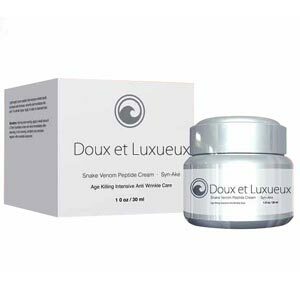 Doux et Luxueux is an anti-aging product which helps to encourage your skin to repair and rejuvenate itself around your face, which can help you present a healthier appearance. It is sold online and the marketing presence for it heavily focuses on encouraging you to “rush your trial now,” and that trial offer is available to you for $5 shipping and handling. However, enrolling for this “rushed trial” will enroll you also in an automatic shipment program, which will send you another supply of the product every month for $80 per month. However, if you cancel within fourteen days – from your request for the trial, NOT from when you receive it – then you pay only for the initial shipping and handling. It is not clear what exactly is included in Doux et Luxueux which might be the concern of customers who have sensitivities or allergies to particular products. There is some mention made of peptides being involved in the formula, although the details aren’t elaborated on, and great emphasis is made that it does not involve injections or similar treatments. We do not have any specific information on how this product is meant to be used, although if it is anything like similar products, you will need to apply it to your freshly washed and dried face several times a day (morning and night are typical). A trial of the product is available. We don’t have a clear idea of what’s in the formula, which makes it hard to be sure it’s safe for people with allergies or sensitivities. The trial/autoship way of selling products can be hard to end, and the monthly price may not be justified given the lack of information on what’s in the product. Doux et Luxueux is not presenting a very attractive image as an anti-aging product for us to place our trust in. The lack of clear information on what is in the product other than a general quantity of “Peptides” doesn’t make up for the assurances that it can provide results comparable to chemical injections. The lack of clinical research (other than a general satisfaction survey) also doesn’t make for encouraging reading – a secret ingredient or two might be understandable as a kept secret, but without any information at all, it’s hard to take that bet. The best answer is to look for an anti-aging supplement that you can trust.